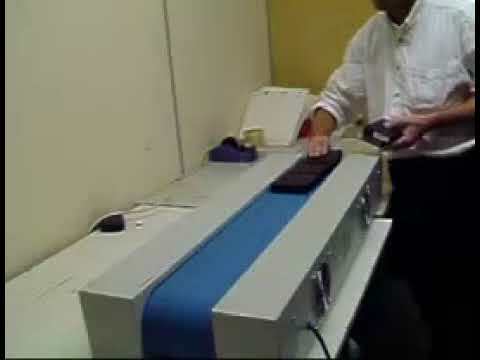 The Verity V880 Automatic Metal Tape Degausser offers highly efficient erasure of high energy cassettes and cartridges in a compact table top conveyor degausser at an affordable price. The conveyor transportation system of the V880 automatically ensures that the media is easily and completely erased. Extra security of erasure can be achieved by use of the optional belt cover, ensuring that media cannot be removed from the conveyor belt until it has passed completely through the erasure field. This cover also ensures that the operator does not come into contact with the magnetic field. The cassettes are placed onto the moving conveyor belt and carried over two degaussing coils that are orientated at 90 degrees to one another in a "V" formation. The belt speed is fixed at 4 inches per second. This permits the machine to completely degauss media with "one pass" degaussing. No longer is the user required to put media through the machine twice to ensure proper erasure. An acrylic belt cover can be purchased as an optional security function so that items cannot be removed until completely erased.